Since ancient times, ginseng root has been used in Korea. Whereas other ginseng products on the market are relatively new, Korean ginseng has been cultivated for centuries to perfection. Ginseng tea can help you feel more invigorated. Korean ginseng has been traditionally developed to maximise your pleasure. Directions: Place contents of packet into one cup of hot or cold water and stir well to dissolve. If desired, add honey or sugar to taste. 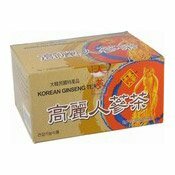 Ingredients: Korean Ginseng Extract, Glucose. Simply enter your details below and we will send you an e-mail when “Korean Ginseng Tea (Instant) (高麗人參茶)” is back in stock!